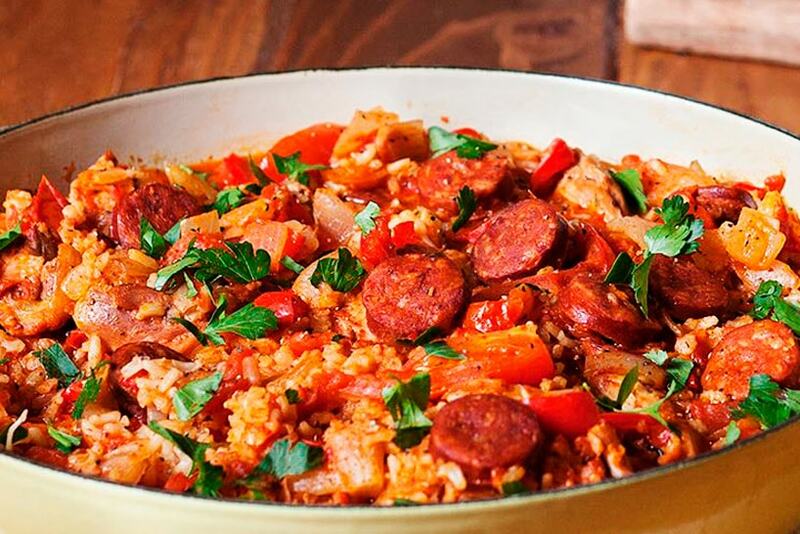 This Paella with chorizo is very similar to a Castilian paella made with various types of meat and sausage. It is a dish for the most carnivorous, as it has no fish or seafood. It is very important to choose the right rice for paella. At no time should you use steamed rice, but a round type that absorbs much more liquid, a paella rice. 1 First, mix the saffron with the broth and heat over medium heat in a casserole dish. Let it stay hot until we use it. 2 Next season the chicken, chopped and clean. In a large skillet, heat half of the olive oil over medium heat and fry the chicken for several minutes, until it is golden brown all over. Once it is done, take it to a separate plate. 3 After the chicken is cooked and in the same paella pan, add the remaining oil and sauté the onion. Scrape off everything that has stuck on the bottom and mix it with the onion. Next, add the capsicum in small cubes and fry it for 5 more minutes. 4 Now add the garlic, paprika and tomato paste and cook for another minute. After this, add the rice and stir to distribute well. Let it all fry together for 1 minute. 5 Pour in the white wine and add the chorizo, and let it cook until almost all the liquid has evaporated. 6 Next pour in the hot broth, add the chicken pieces and stir to make it uniformly. Increase the temperature so that it comes to the boil, and then lower it to medium heat so that it cooks for 18 minutes until the rice is al dente and the broth has been completely absorbed. 7 To finish, turn off the heat and let it rest for 5 minutes. Before serving, add the parsley on top. Instead of the tomato paste, you can use crushed tomato or chopped natural tomato without skin and without seeds. If you don’t have chicken, you can use prawns, ham, rabbit or any other meat you have on hand. There are so many variations of Paella but this Paella with chorizo is definitely the most carnivore approved! Try it and you will fall in love with Spanish cuisine.